"Gwen Lawrence led my players in yoga exercise for 12 years. She is a highly motivated individual who has the tremendous skill of applying the principles of yoga to meet the specific needs of athletes. Her creativity and knowledge of yoga enabled her to provide exercises that worked around a player’s physical limitations. Many professional athletes have a history of injuries that limits them from bending their bodies in certain positions. Whether it was an arthritic knee or an ailing back, Gwen was able to manipulate an exercise so that the athlete was able to benefit from the movement." 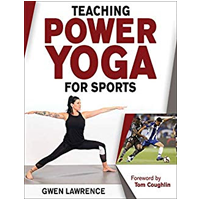 "The Yankees have utilized Gwen Lawrence’s services as an alternative way of proving the core stabilizations program of our players through her system of Power Yoga for Sports. I have found her to be extremely professional and look forward to working with her more." “I have worked with Gwen for only a couple of months and I have recognized tremendous gains in my flexibility, core strength and balance which are essential to staying healthy and explosive. I consider myself lucky to have learned as much from Gwen as I have in such a short time." “I had some unusual thoughts and preconceived notions about what yoga was really going to be and she kinda wiped those totally out…I really felt like it was going to be breathing and light stretching, but nothing could have been further than the truth." "My mom tried to get me to practice yoga for a long time before she found Power Yoga for Baseball online. I was 14 the first time I did it and as a senior in highschool I was using the DVD a few times a week. Now, I use it at least three days a week as a professional. I believe it has helped me with my flexibility, obviously, but also with my focus and ability to calm my self down if I need to, and with my balance. Its a great addition to my strength training. I am so glad to have found these DVDs because I am not sure I would have been open minded enough to really give yoga a chance if I had to do my mom's videos or take regular yoga classes. Power Yoga for Baseball is the perfect way to introduce athletes to the benefits of yoga." "My name is Gabriel Ruivo, and I'm a triathlete. The swimming part was the hardest for me, because my technique wasn't very good.Then I met Gwen Lawrence and her innovated method, Power Yoga For Sports. Since then, I've got more flexible and I improved my swimming technique, becoming faster and breaking my personal records! Thank you very much Gwen."